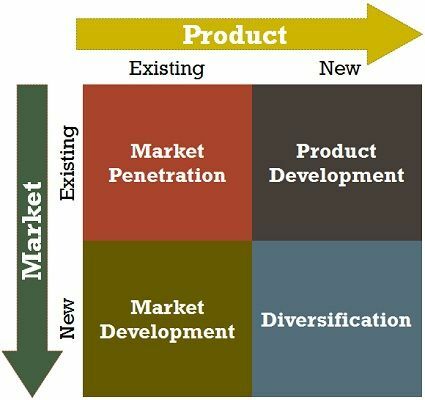 Definition: Ansoff Matrix, or otherwise known as Product-Market Expansion Grid, is a strategic planning tool, developed by Igor Ansoff, to help firms chalk out strategy for product and market growth. It is a business analysis technique that is very useful in identifying growth opportunities. The matrix best exemplifies, various intensification alternatives before the firm, i.e. the business gets an idea of how the success of the firm relies on its existing and potential market and products. The product and market are two dimensions of the grid, which when combined, gives birth to four growth strategies. Market Penetration: A growth strategy wherein the firm seeks to sell existing product into existing market, with the aim of increasing overall market share. This can only be possible when the company makes more sales to the present customers or by discovering new customers within the established market, without significantly changing the products.Penetration requires huge expense on advertising and personal selling. To lead the competition in an established market, demands aggressive promotional campaign, backed by a pricing strategy that attracts more and more customers. When the company pushes its product to new geographical market by increasing sales force, sales agents, or through franchising. Increasing sales and attracting new market segment by making slight changes in the product like new packaging or product dimensions. Product Development: A strategy in which firm seeks growth by introducing a new product in the established market. The firm stays in the existing market but increases the range of products offered by the company, for further growth and expansion, i.e. if the new product yield good returns, in the form of additional sales will increase the market share.Product development is possible by investing in R & D of a different product, acquiring rights to manufacture someone else’s product, in order to appeal the present market. Diversification is the riskiest growth strategy as it neither depends on firm’s successful product nor its position in the market. In other words, the company gets into the business, in which it has no or negligible experience. However, there is also an opportunity for the business to create a competitive position in the new market. Whenever there is a change in the market conditions, the company may also change its product-market expansion strategy. For instance: When the present market is completely saturated, it switch to new markets.